Flowering Date Early to mid summer. Several bright red, bell-shaped flowers adorn each sturdy stem. 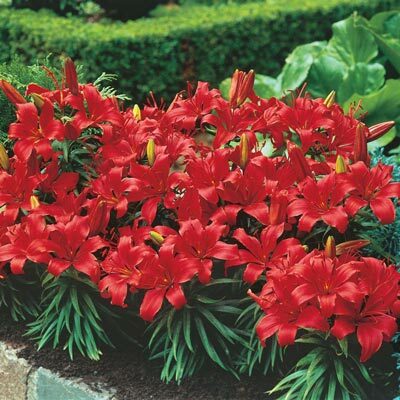 Full, upright blooms are surrounded by lush green foliage. Great for naturalizing. Don't be fooled by their small height, these beauties bloom full size! Flowering Date: Early to mid summer. 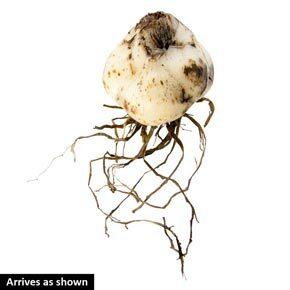 Winter Care: Leave in ground - in colder zones make sure bulb is covered with minimum of 5" of soil. Flower Form: Full upright flowers. Several flowers per stem. Foliage Type: Short, lush green foliage encircling a sturdy stem. Pruning: Important to let the foliage die down naturally in fall. This helps provide nutrients for next season's bloom. Late fall.